Early October means Halloween is just around the corner. It’s around this time I always begin to think about my Halloween costume as the ready-made costumes look awful and tacky and I spend hours trying to research a cheap but “cool” way to dress up! Of course, when I lived in London this wasn’t so much of a problem as Halloween wasn’t such a big thing. However, since moving to New York, I have to admit, I am now making up for all the lost years of dressing up and Halloween partying! I guess it’s time to join the SpOooOooky fun! Here is a list of my top 7 things to do for Halloween in New York. My husband and I have thrown a couple of Halloween parties and what a hoot they were!! Decorating for a Spooktacular evening is so much fun! Everyone who attends also makes a tone of effort dressing up! I have always been keen on semi making my own outfit. While time is always an issue, and my patience for sewing and sticking things together is minimal, I still spend hours trying to find the right costume! In true New York style, about a month or so before Halloween, tailored Halloween shops begin to open which contain all the costumes and accessories you can think of (these shops are also like mini haunted adventures with dead zombies and ghosts hanging around). Most of the costumes are cheaply made and some are quite expensive. Nevertheless, if you hunt around or think outside the box, there are definitely some great costume finds. You can get accessories like fake blood, nails, big eye-lashes, fangs, glow in the dark face paint, belts, plastic knifes, eyeballs and wigs. You name it, they have it. Be warned, most of the Halloween shops have a no return policy on or after the 16th October, so be sure when purchasing. Below are all of my Halloween costumes to date!! 3. Visit The Great Jack O’Lantern Blaze. At the Great Jack O’Lantern Blaze you will be able to view more than 7,000 individually hand-carved, illuminated jack o’ lanterns. 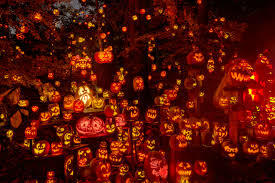 It’s a walk though show where you can wander through a historic, 18th-century riverside landscape and discover a great Halloween pumpkin display and they all made of jack o’ lanterns! Rain or sun, the event still goes ahead. It’s a great night out for the family and you get to see some exquisitely carved pumpkins. Tickets for Adults, $20; Children 3-17, $16 (Saturdays $25, $20) FREE for children under 3 + members. Location & Directions: Van Cortlandt Manor is located on South Riverside Avenue off Route 9 in the village of Croton-on-Hudson. Metro-North’s Hudson Line trains depart Grand Central Terminal in Manhattan. Take the train to Croton-Harmon station (under an hour from Manhattan) where cabs wait to meet each train. Van Cortlandt Manor is a 5-minute cab ride or 10-minute walk away. 4. 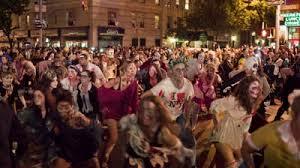 Visit the annual New York Village Halloween Parade. New York’s annual holiday parade is filled with costumes, puppets, dancers and artists. There are dozens for floats, bearing colours and musical bands. Every year over 50,000 people parade up 6th Avenue in the most scariest and hilarious costumes. Marchers line up on Sixth Avenue between Canal and Spring Streets. The Halloween parade stretches a mile long and runs from 6.30-8.30pm. Visit http://www.halloween-nyc.com/ for more information. 5. Visit a haunted house! Want a chilling experience? Why not visit one of New York’s haunted house attractions. The New York Haunted Hayride is a gripping haunted attraction. It is located at Randalls Island Park. You will get to see ghostly apparitions, psycho clowns, demonic possessions and more. I warn you, it’s not for the faint hearted, as the New York Haunted Hayride is all set to terrorize those who dare to enter. Don’t worry there are other haunted attractions to choose from as well: TimeOut New York has the best list! 6. Carve your own pumpkin! If all else fails and there is no Halloween party or parade in sight, buy your own little pumpkin and have some carving fun! Most grocery stores sell pumpkins and pumpkin carving kits. Make sure to cut off the top and scoop all the seeds out. Then using a stencil or if you feel creative, free hand carve out a shape, face or castle (whatever you want really). Here is my first ever carved pumpkin fun! Once all carved out, stick a little tea light candle inside and you will have your very own DIY Jack O’Lantern. You can also make your own quick and easy little treats as well – check out my “Halloween Treats” blog here! Thank you for linking with #ShowcaseTuesday and H🎃ppy H🎃lloween to you too. As usual thanks for always reading and supporting Blog centre! I am not use to this Halloween mania but I guess I have to join in to have fun! Hope you have a spoooktacular day!